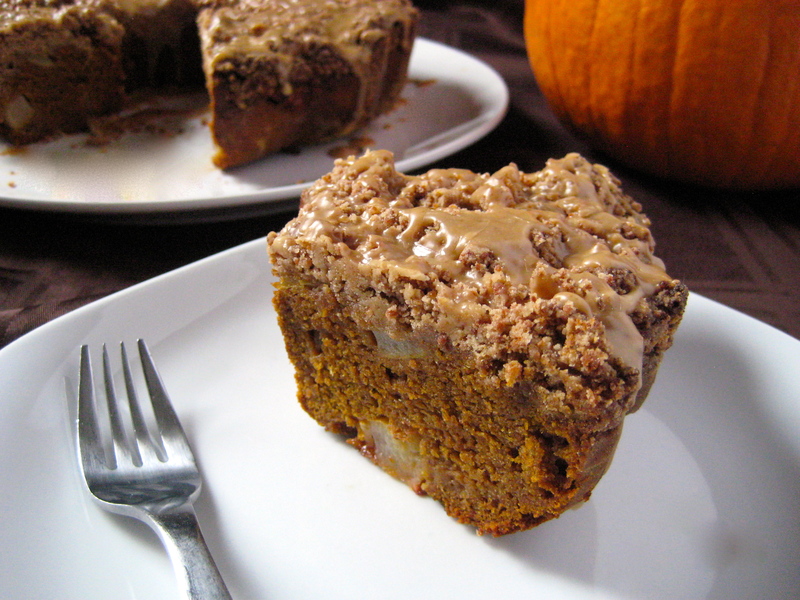 A perfect-for-brunch pumpkin cake with a crunchy crumble topping and a sweet maple glaze. If you don’t have pears on hand, try fresh cranberries, apples, or your other favourite fall fruits. Preheat the oven to 350 degrees F. Lightly oil a 10-inch (12 cup) bundt pan. Dust with sorghum flour, tapping out excess. To make the crumble, put the sorghum flour, sugar, tapioca flour, cinnamon, ginger, nutmeg, and salt in a medium bowl. Whisk well to combine. Add the vegan buttery spread, stirring to mix. Use your fingers to press the crumble mixture into small clumps. Refrigerate until needed. To make the cake, put the sorghum flour, teff flour, 6 tablespoons of the tapioca flour, the cinnamon, baking powder, ginger, xanthan gum, baking soda, salt, and nutmeg in a medium bowl. Whisk well to combine. Put the coconut oil, sugar, nondairy milk, ground flaxseed, and vanilla extract in a large bowl or bowl of a stand mixer. Using a hand mixer or the stand mixer, beat on high speed until emulsified, about 1 minute. Add the pumpkin. Beat well to combine. Add the flour mixture. Beat on medium speed until just combined. Put the pears in a bowl. Add the remaining 1 tablespoon of tapioca flour. Toss to combine. Add the pear mixture to the cake batter, along with the cider vinegar. Stir to combine. Scrape the mixture into the prepared pan, spreading evenly. Remove the crumble topping from the fridge. Top the batter with the crumble in an even layer, pressing down slightly. Bake for 60 to 70 minutes, until a skewer inserted into the cake comes out clean. Let cool in the pan for 10 minutes, then put a plate over pan and turn it over to remove it. Carefully invert the cake onto a second plate so the crumble topping is facing up. Cool completely before glazing. To make the glaze, put the icing sugar, maple syrup, vanilla extract, nondairy milk, maple extract (if using), and salt in a bowl. Mix well to combine, adding more milk if necessary to create a drizzly consistency. Pour overtop of the crumble. Let stand about 20 minutes to set before serving. Thank you 🙂 I know you loved it! I’ll take that as a good thing! That looks amazing. I don’t know about the pear part – but if it tastes like it looks then this would be awesome.